An improvement to supporter perks, you can now choose your broadcast resolution. Currently, the options are from 240p, 480p and 720p but more could be added at a later date. Choose your quality setting either in the source selection pop-up or in your user settings. Additionally, you can also set the stream quality to receive, reducing all cams to a lower definition. These options should allow for better network performance on mobile data services, or if you just want to conserve bandwidth. 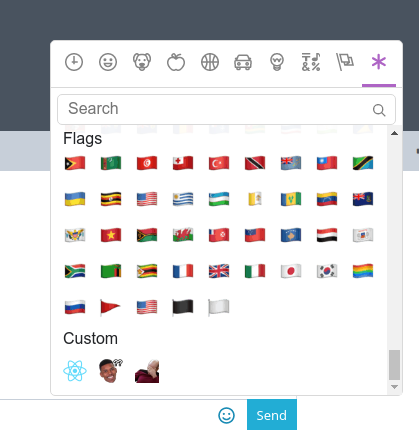 Rooms who's owners are gold site supporters are now able to add custom emojis! Room owners themselves can upload emoji, but permanent moderators can too. Emoji can be used by anyone in the room. 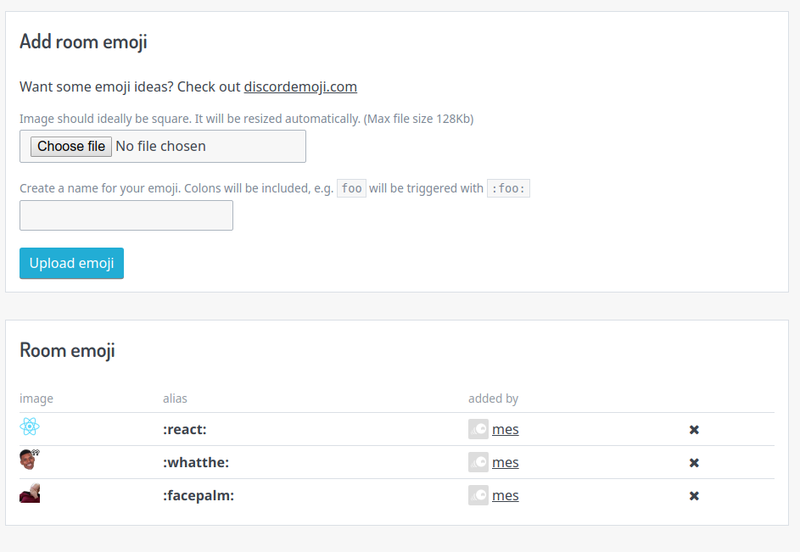 The upload form for emoji can be found on a new room settings page, which can be found at jumpin.chat/<room name>/settings/emoji. Here you will also find a list of all the current emoji as well as who added them. There's no limit to the number of emoji you can add, so be sure to upload plenty! Do note, you can gift support to a room owner to give them gold for an amount of time, so the burden is not entirely on a single person. You can now gift support to other members! Just head to their profile and hit the "gift support" button. When choosing the one-time option, you will now receive gold perks for a duration. This is calculated at 14 days of gold supporter status for every $3 you spend. Additionally, you can now select a custom amount to give, up to $50 at a time. Check out how to become a site supporter and what perks you can get! You can now send messages to users directly, outside of chat rooms. To do so, go to a user's profile and hit the 'Message' button in the sidebar. You can also see your inbox by opening your user menu. By default, if you have a verified email address, you will receive notifications on each new message. You can change this in your user settings. Issue where closing broadcasts of users who joined after you fixed. A "what's new" widget documenting the fixes and features I add to the site. Keep an eye on this feed if you want to know the latest improvements to the site! Issue when using /ban against a user that never joined the room creating an undefined ban item should now be fixed, for real this time. You can now see registered rooms you visited recently on the home page. Both public and private rooms will appear here, so you won't lose track of where you've been. This does not affect whether rooms appear on the public directory, however. 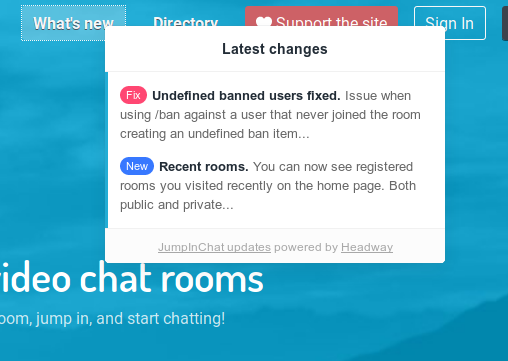 Surely JumpInChat will start publishing changelogs very soon.